This post is a little late but, I did want to share a little of what spring fling is like. As usual, it seems like a lot of packing for spring fling. I brought an ironing board and iron to share, as well as, my sewing machine, clothing and projects. There’s also an extra large bag of scraps from last year, which will eventually become a benefit quilt. 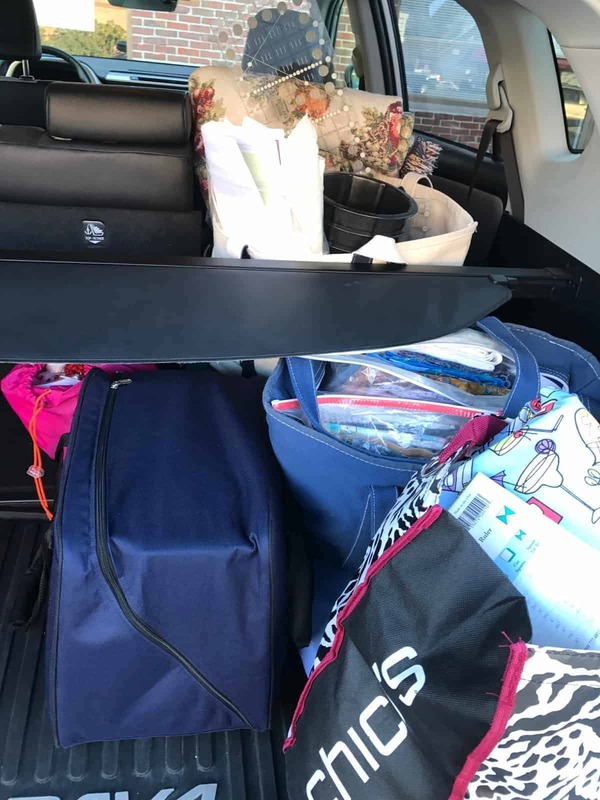 Not the best picture, but here’s what the back of my Rav4 looked like with just my stuff in it. We arrived and the weather was gorgeous. It was nearly 50° and the sky was so blue. The sun, snow, shadows and sky were truly inspiring. I loved the shadow of the trees on Lake Winnipesaukee, in NH. The house is a modest – a camp called Geneva Point – but sleeps 20, 2 to a room with a bathroom in each room. The downstairs has two large rooms; one with a fireplace where we setup 10 tables, 2 people per table. We also have cutting and ironing stations around that room (and snacks too). The other room has tables we use for our dinners (catered/brought in for 2 nights) and projects where you might want a design wall or need to spread out. It is not luxurious, but, it has everything what we need for the weekend and some mighty good views – mountains nearby and the beautiful lake. Most years there is still some ice on the lake when we arrive. This year, we had a little snow (10″ on Saturday). I got a fair amount done. I worked hard on two quilts which are very nearly complete tops. I also worked a little on some Sew Together bags that were previously cut out for a class sample. 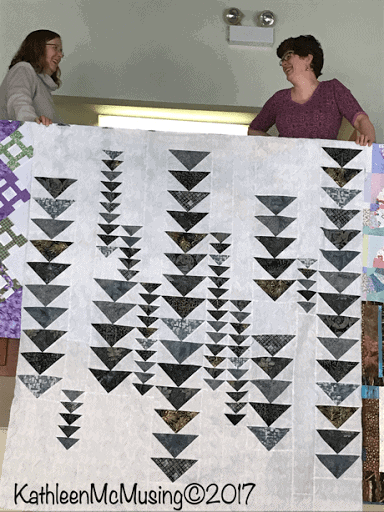 The first quilt I focused on was “Heading South”, a pattern by Material Girl Quilts. I won this pattern a year or so ago, as I did some of the fat quarters. I merged them with a few other pieces I had left and voila, here is my version. I expect borders, but didn’t do that during the weekend. Displaying the quilt on the upstairs bannister. 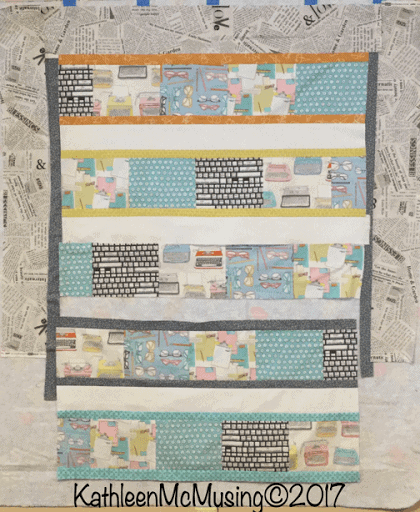 The second quilt that I spent a lot of time on, I refer to as my “typewriter quilt”. It has quite a few novelty fabrics (typewriters, glasses, old fashioned typewriter keys, and text messaging abbreviations. I am pretty excited about one piece of the the plan I have for the quilting. It too needs borders and here’s how far I got mostly because I left a piece home – ARGHHH. The fling sounds like a wonderful time! Thanks, Yvonne, it was great fun. 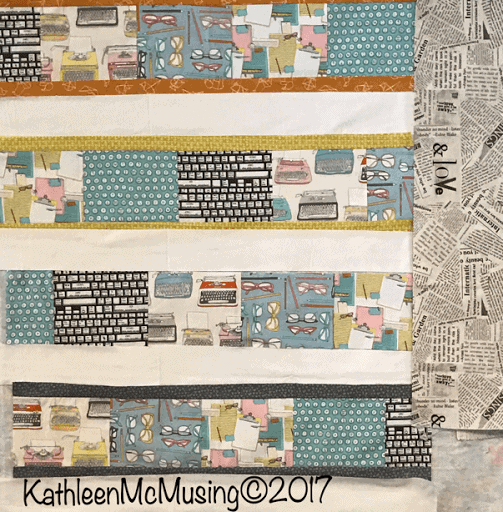 I just finished the top to the typewriter quilt so I am feeling good about the work that began then!